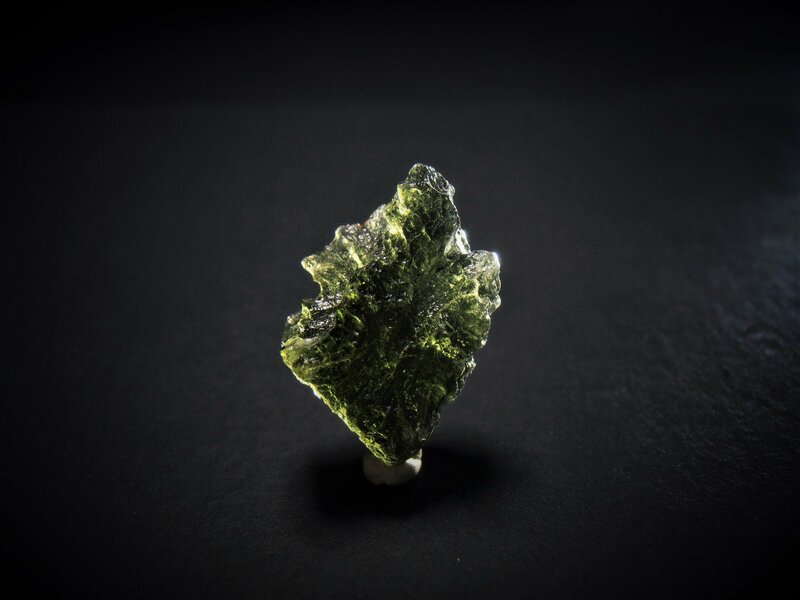 This moldavite tectite is from South Bohemia, Bohemia, Czech Republic. The tectites from this area have a unique green color. They were created approximately 14.7 million years ago when a giant meteorite impacted the earth near modern day Nordinger Res. The liquefied crust, caused by the impact, was ejected into the atmosphere and then fell back to earth in a broad pattern extending hundreds of square miles. As the molten material fell splatter patterns and other aerodynamic surfaces were created on the pieces as they cooled. They are similar to volcanic glass or obsidian in make up. This specimen is shaped and resembles a teddy bear. It weighs 1.3 grams and it measures 17 x 12 x 6 mm.